Horoscope A horoscope is a chart that shows the positioning of stellar rays of planets at the specific moment of an individual`s birth. 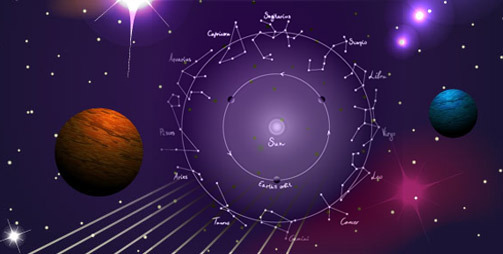 A natal chart is cast based on astronomical calculations.. Time and place of birth are the basic factors in a horoscope. Based on the level of accuracy of the above two factors, it would be easy to delineate the character of an individual and predict the events that would unfold in one`s life. One has to realize that one`s past deeds determines the present and future conditions to be harvested by the individual and the chart indicates the areas to be worked upon in the current lifetime. It also comprises one`s entire personality that is unique for each individual. It shows the zodiac signs, 12 houses, 9 planets and lagnas. Planets represent the inner forces of one`s personality and all planets wield influence in one`s life at some time or the other. The 12 zodiac signs are the divisions of the heavens relative to the vernal equinox and the ecliptic which are the places of reference in space. Each of the 12 signs of the zodiac has exactly 30 degrees, which never varies, thereby making a complete circle of the zodiac of 360 degrees. The 12 houses or bhavas represent the entire history of the individual. The 12 houses are the stellar divisions relative to the birthplace and horizon which are places of reference on the earth. Planets influence our lives through the 12 houses that correspond to the various aspects in one`s life. They govern areas like self, relatives, brothers, mother, intelligence, sons, faith in God, enemies, love and marriage, deaths, guru, career, gains, sub conscious mind, and expenditure. Lagna is the first house or ascendant sign or the rising sign. Each of the 12 houses and each of the nine planets can be used as a lagna or baseline from which predictions can be made. In practice, there are a large number of lagna which signify the baseline character of all life`s activities. For example, to judge the emotional character and all responses to life, one should read from the Chandra lagna. The 12 houses are carried by us in the aura that surrounds each individual. Each house shows one a part of life and lessons to be learnt in one`s lifetime. It represents the merits earned and misdeeds done in past lives and we reap from each house what we have sown at the destined time. The varying angles of the sun and the planets create different physical, moral and mental tendencies in an individual. The states of consciousness experienced by one correspond to particular planets. By understanding the stellar forces in the play of destiny, one should accordingly regulate life advantageously. The different physical, moral and mental tendencies in an individual are created by the varying angles of the sun and the moon. Particular planets help create the different states of consciousness experienced by one. Life should be led with deep awareness and acceptance by understanding that the stellar forces are responsible in the play of destiny.